That’s the point, I think. I’ve long thought that all these ancient, massive cathedrals are designed that way to make you aware of how small you are in the face of the eternal, of the divine. And the Chapel is more akin to a cathedral than whatever comes to mind when you think “chapel” — it’s the third-largest university chapel in the world, with an architectural style to match. So whenever I walk in, I am struck by how grand it is, and I feel small. In a good way. The Chapel is one of my favorite places on campus. I spend every Sunday morning there, singing in the weekly non-denominational worship service as part of the Chapel Choir. 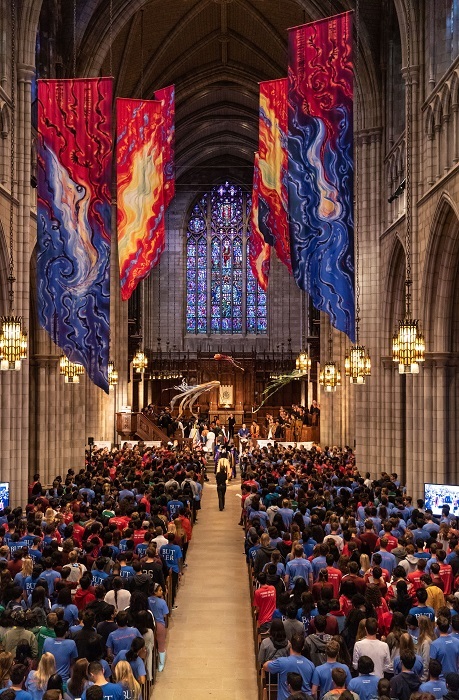 In the first week of my first year, I and all the other first-years attended the Opening Exercises for the Class of 2021, right there in the Chapel. I loved the ceremony of it, the grandeur, everything from the kites in the procession to the stately robes worn by the faculty to the hymns the Chapel Choir sang. That was when I decided I wanted to spend more time in the Chapel, and audition for the Chapel Choir. The Chapel is home to a number of other important events in the University calendar, among them the Baccalaureate Service at graduation and the Service of Remembrance to commemorate alumni who have passed in the last year. But for me my favorite moments in the Chapel are those Sunday mornings spent in song and quiet reflection, the morning light streaming through the magnificent stained glass windows.